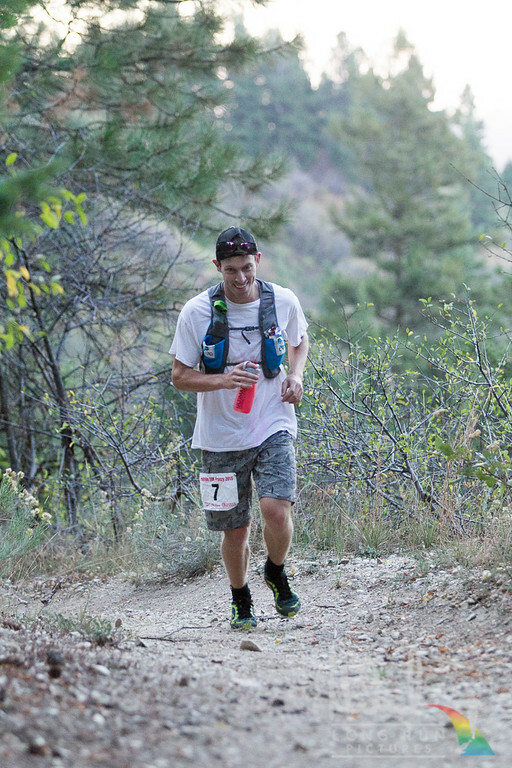 Foothills 50K Frenzy (2015) – My First 50K! Back in August or so I noticed that there was a 50K that took place in Boise: the Foothills 50K Frenzy. I wanted to get the Mt. Nebo Marathon out of the way before I signed up for something else, mostly to make sure I wasn’t injured. Upon completion of the marathon, I was feeling pretty good and a 50K was sounding more and more interesting. I liked the idea of the Foothills 50K Frenzy since I wouldn’t have to travel anywhere and with the 6am start I could probably be home by noon as long as I didn’t have a complete meltdown. That would make things relatively easier for Cyndi, who would end up staying at home with the kids while I was out having fun. I had never run an ultramarathon before, so I decided that this was my best opportunity and I signed up. I wasn’t quite sure what to expect from a 50K with 5600 feet gross elevation gain. I had never run more than 26.2 miles, and this would be about 31. While I try to include some hill training in my normal routine, I hadn’t done much in the past couple months. The Mt. Nebo Marathon was pretty much just downhill, with maybe 600-700 feet of gain and 5000 feet of downhill. Fortunately, I had done two nice hill workouts in July and August in preparation for Nebo, one of them was on some of the same trails the Foothills 50k Frenzy would cover. That training run ended up being a blessing. It was one of the only long trail runs I’ve done and I learned that it’s OK to walk on some uphills on a trail run. That run gave me some confidence that I could complete the Foothills 50K Frenzy without perishing a slow death. Packet pickup the day before the race was at The Pulse Running and Fitness Shop in Meridian. It was nice to meet Jenny, the race director, and a couple other people with 50K+ experience. This was going to be a “green” race, and our discussion made me feel better about my plan to just carry a water bottle in my hand rather than sporting a pack around my waste or shoulders. Packet pickup was pretty low key — no booths or anything. There were no shirts for the Foothills 50K Frenzy, per “tradition,” but they did give embroidered backpacks. I would have preferred a shirt, but it wasn’t a big deal. I ate some extra carbs on Friday and got to bed by 10pm. I was excited for the race, but I wasn’t nearly as anxious and worried as I usually am before marathons. I’m not sure if this is because I’m getting used to it, or because I wasn’t worried about my time and performing my absolute best. Probably the latter. I just wanted to finish, hopefully under 5 hours, and have a good experience. My alarm went off at 3am so that I could eat a sandwich and banana. I went back to bed then woke up at 4:15am to get ready. I was very happy that my head was feeling well. I had developed a migraine the previous Sunday night which had been with me all week long. I relied on ibuprofen, advil, and caffeine all week and even had to miss a day of work. I asked some friends for a priesthood blessing on Wednesday night because it was so bad. Fortunately it cleared for the race on Saturday morning. I arrived at the parking lot at about 5am and picked up my race bib. They only gave out race bibs the morning of the race so they would know how many people were on the course. The starting line was right in the Ft. Boise parking lot, which was very nice because I could sit comfortably in my warm car while I waited. The race director gave some instructions right before the race. Then one of the runners, Derek Call, sang the National Anthem, which was a nice touch. Everyone fired up their flashlights and headlamps and we were off at 6am for the Foothills 50K Frenzy. The first mile or so of the Foothills 50K Frenzy is fairly flat, with only a slight uphill. My primary goal in my first 50K was to finish without a major bonk at the end, so I went out very measured and under control. Around Mile 1 there was a steep climb as we began to get into the foothills. From the top of the first little hill there was a spectacular view of ~100 headlamps winding up the trail with the lights of Boise in the background. It was one of the coolest things I’ve ever seen during a race. I passed several people after the first half mile after everyone settled into their pace. The trail and the darkness made it difficult to pass until a good spot would present itself; however, this also helped me control my pace. I would fall in behind someone and stay there as we scrambled up the trail. Once we started hitting steep trail, I watched my heart rate closely and I would hike/walk any time my heart rate approached 170 BPM. I did not want to burn myself out in the first third of the race, which was basically all uphill. The walking strategy worked pretty well. I found that I could often keep up with runners that were jogging. If I jogged instead of walked my heart rate and legs seemed to get much more tired. I was holding a flashlight in one hand and a water bottle in the other. I don’t have a water belt or pack, and I didn’t want to buy one nor try one out during a 50K. Holding the light and water in my hands worked out pretty well, but I looked forward to dumping my flashlight at an aid station. Holding things in both hands did make it a little hard to drink, since my water bottle had a screw-on lid, but it wasn’t a big deal. I think next time I’ll take an extra lid just in case I drop it. As we approached the aid station at about Mile 6.5 of the Foothills 50K Frenzy it was definitely starting to get lighter outside. Runners were starting to spread out a bit, but there were still a few around me. I could see a flashing red light a few hundred yards ahead which I assumed was the first runner or a lead mountain bike. 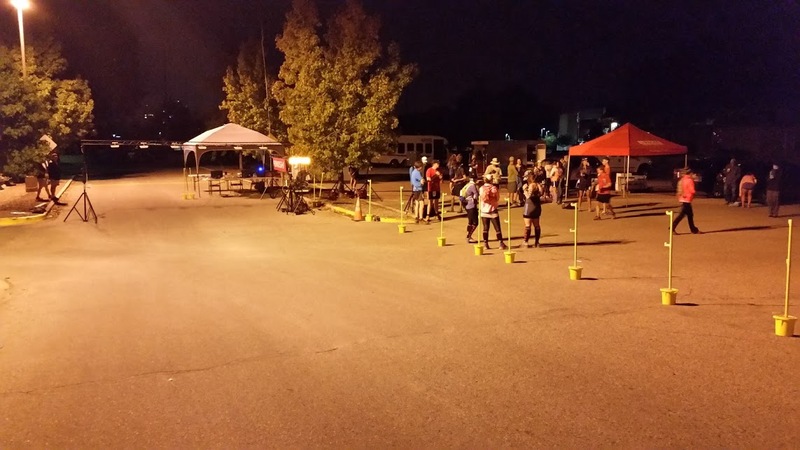 Ultramarathon aid stations are not the same as a typical marathon aid station. I ran up to the station at Mile 6.5 and asked them to refill my water bottle with Tailwind, the sports drink they had available. They had some gummy bears and I grabbed a few. I dumped my flashlight and knit gloves. Before I left they offered me some quiche, and I figured “why not?” So I took a bite of that and decided any more egg, sausage, and pepper-laden quiche would probably be unwise. (The one bite actually settled pretty well though.) Someone mentioned I was 4th or 5th at the station, which surprised me, although I hoped I’d be in the top 10. Just then someone ran by without stopping, which meant I was in 5th or 6th. I took off revitalized and refueled. I knew the next 5 miles would be tough and hoped to get through them with plenty of gas left over. Shortly after the aid station I tripped on a rock. Fortunately I caught myself, but I realized that it was still fairly dark and I needed to be careful without my flashlight. I caught up to the person ahead of me, but the trail was narrow, rocky, and dark, so I couldn’t pass him for a long time. It wasn’t an issue for the most part, but there was one long downhill starting at Mile 9 where I would have preferred to go faster. I’ve found that holding back on downhill just shreds my quads and I’d rather go fast than slow myself down. That downhill was a little disheartening. At one point I could see someone that was far head of me but at a much lower elevation. I knew we still had to go up, so going down just meant more going up. Once we reached the bottom I knew it was going to be the long 1700 foot climb to the top. I alternated jogging and walking depending on the steepness of the terrain and how hard my heart was beating. I traded places with the runner that had been ahead of me several times. There were also a couple runners close behind. 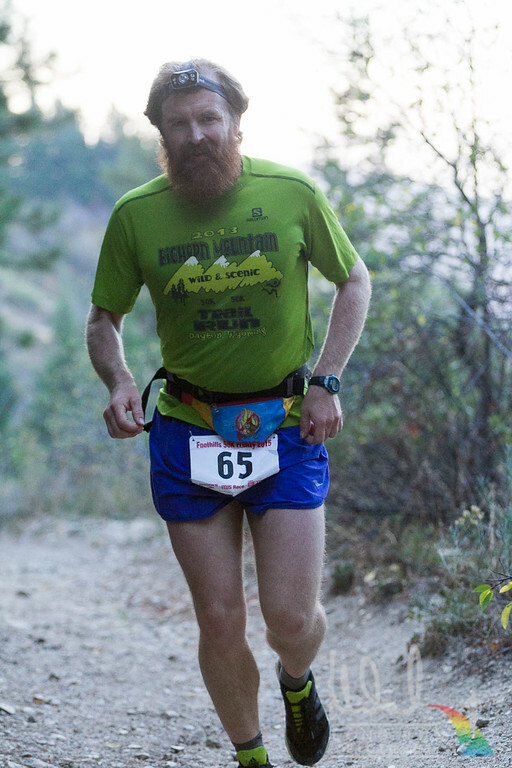 One looked very much like an ultramarathoner: he had a nice beard and was sporting a shirt from a previous ultra. The other had a water pack on, but also had a cotton t-shirt and what looked like board shorts. Who wears a cotton tee on a 30+ mile run!? Not me. Textile technology has come much to far to be wearing a loose cotton t-shirt during an ultramarathon, in my opinion. That said, I always underestimate runners wearing t-shirts. I’ve been beat by t-shirt wearing marathoners in my last two marathons. Who wears a cotton tee on a 50K? This guy. I believe that all the guys I was around ended up beating me to the top. I did the most walking for sure. This was probably the right thing for me to do as I really didn’t have much uphill training under my belt and this was my first 50K, so I wanted to be a little conservative. The Foothills 50K Frenzy has an aid station right at the top of the mountain, at ~Mile 11.5. We had climbed net 3100 feet or so at this point. It was nice to be on top! I knew the most risky part of the race for me was over. Right as I came upon the ridge road at the top, I also got a glimpse of who was ahead of me: Zeb Perez (found out his name later) was in first, followed by another guy, then a lady. Then came the three guys I was climbing with and finally myself. There was a short out and back after we made it to the Ridge Road on top of the mountain. We turned left at the aid station, ran a half mile or so, then came back. I’m pretty sure the out-and-back was shorter than it was supposed to be. I stopped at the aid station on my way back and had a peanut butter pretzel and a couple other little snacks. I refilled my water bottle with Tailwind and was on my way again. On the way up the mountain I drank what seemed like a lot. I guess it amounted to about 30 ounces since I emptied my 16 oz bottle twice and it wasn’t quite full the first time. I think this strategy worked out well — I focused on drinking when I was slowly climbing. I tried to cram as much into my stomach as I could handle since I knew I’d need it later. On the ridge road the bearded man had to stop to relieve himself so I passed him. He passed me a bit later and stretched out his arms in the sun, declaring what a beautiful morning it was. I agreed. It was crisp and sunny. We both passed a guy in a red shirt that I had gotten stuck behind on that downhill portion a few miles back. Then the bearded man sped ahead and caught up with the cotton t-shirt runner. I could see them about 100 yards ahead before we started heading down a steep section of dirt road. On the downhill I picked up my pace. This was part of the Race to Robie Creek course (albeit in the opposite direction) and I was very familiar with it as I’ve ran that race 6 times and I’ve trained on the dirt road a lot. I eventually caught up with bearded guy and cotton guy, and we chatted a bit. They were friendly and we were all feeling pretty good. I can’t remember where, but at some point we all caught up to the lady in front of us. Her name was Brittany Goicoechea (I found out later). The four of us reached the aid station at about Mile 16 at around the same time and we all took off on a trail back into the hills. Once again I found myself going slower than the others on the uphill. Beard guy and cotton guy started extending a lead over Brittany and I. Brittany beat me to the top of the hill, but then I passed her after a long downhill. There was a turn at the bottom of the downhill where I may have gone the wrong direction if Brittany wasn’t there to lead. Brittany and I continued trading places for the next 10 miles — between the Foothill 50K Frenzy aid station at Mile 16 and the one at Mile 26. Meanwhile, I lost sight of bearded guy and cotton guy. I couldn’t believe they had extended the lead that much. I thought that bearded guy may have some good experience, but cotton guy didn’t appear as experienced and I thought he may have burned himself out going up the hill a little too fast. I knew that anything could happen in the last few miles. I’ve had melt-downs in 26.2 mile marathons, and we would be doing about 5 miles more than that. Anyone could easily be forced to slow way down or walk, so I still hoped I could catch the two guys in front of me. We came to some big clearings where I could see a long ways in front and I couldn’t find them. Brittany was better on the uphill, but I tended to move faster on the downhill, so we continued switching places. I was getting very tired of the uphills and my quads were starting to object. My right leg especially was getting sore. A few times one of my calves would also start to cramp, but fortunately I didn’t face any significant cramps or issues. Some of the downhill was pretty technical. There were some rocky and sandy parts where I really had to fight against going too fast or I might hurt myself. I still pushed as hard as I could on the downhill since my uphill speed was so poor. I was surprised at how relaxed I was. Once I’m over Mile 20 in a marathon, I’m usually starting to fall apart, but I felt like I was doing OK in this 50K. I also wasn’t as concerned about which mile I was on. I was kind of enjoying myself, and I never reached a breaking point where I just wanted to stop and lay down, like I often do in a marathon. Nevertheless, I was tired, and the farther we went the more every little uphill taxed me. I beat Brittany to the aid station at Mile 26, which would be the last. I grabbed some potato chips and water. She came up behind me and I took off. There was a very slight uphill which hurt to go up. My quads just couldn’t take it. I slowed down and Brittany blew past me. I hoped I could catch her on upcoming downhill, but that would never happen. The farther we went the more she extended her lead. I was still running at a pretty good pace, but she was moving fast and not slowing down at all. She had a great finish which was very impressive. I realized that was the most I’d ever run in one day, which was great. I was still feeling pretty good, but I was definitely ready to be done. I was glad that there would be some downhill to help me finish the last few miles. With Brittany speeding ahead, I was pretty much alone. There were some mountain bikers and hikers out by this time. I had to ask a couple of them if a lady in red had passed to make sure I was going the right direction. My spirits were pretty high still, although I was beginning to drag. There was still no sign of bearded guy and cotton guy, which puzzled me. At one point I asked a couple hikers how far the guys ahead were, and they said 100 yards. I laughed since I could see 100 yards ahead of me. I don’t think they understood what I was asking. I passed a group of hikers with about a mile left and tripped hard on a rock. Luckily I kept my footing and didn’t fall on my face, although it was close. There were some steps we had to hike up and then a couple final stretches. Right before the last turn there was a sign that was twisted sideways. I stopped to make sure it said to turn. I turned and ran the final stretch to the finish. It was so great to finish! There wasn’t much of a crowd there, but there were a few people that cheered and an announcer who said I was the 3rd male finisher! That was surprising as I knew of at least 4 guys ahead of me. However, before clearing that up, I decided to run another mile. My watch only said 30.5 miles, and I wanted to make sure that my first 50K was really 50K, so I just jogged around in big loops until I hit 31.5 miles. I had been planning on 32 miles, so I wasn’t so wasted that the last mile was a huge problem. In any case, I took it really easy and did a 10 minute mile or so. When I got back, I chatted with the race director. She gave me a nice 3rd place male finisher plate and I got to select a finishers mug. These were both made by Kevin Flynn, a local artist and ultrarunner, and they are really cool. I asked her how I was 3rd, and she said that two people had taken a wrong turn: beard runner and cotton runner. The guy with the beard was hanging around the finish. I chatted with him a bit. He had a good attitude about it all and was just happy to be there and happy that he had a good run. He said the guy in the cotton t-shirt was pretty wasted by the time they realized they had gone the wrong way, so I think he had just gone home or something. About this time, 10 minutes after finishing, my wife, sister-in-law, and two nieces arrived to cheer my finish. Apparently Cyndi, my wife, didn’t believe me when I said I might be close to 4.5 hours! They showed up closer to 5 hours and were too late! It was still good to see them and Cyndi took some pictures of me at the finish line. Then they left so they could get back home to all the kids. I stuck around and grabbed a post-race sandwich, cookie, and chips. I also met John, who I had communicated with via Strava. He lives a few miles from me so we’ve had some back and forth breaking each other’s segment records. It was good to finally meet him and chat a bit. We also chatted with Zeb Perez a little, who ended up winning the race. I gave my regards to Brittany and congratulated her on a strong finish. This is great! I’m running this on Saturday as my first ultra and didn’t really know what to expect. The write up really gives me an idea of what to expect and how to plan my race out. Thanks! Good luck! It’s a fun race, and it looks like you’ll have some great weather.